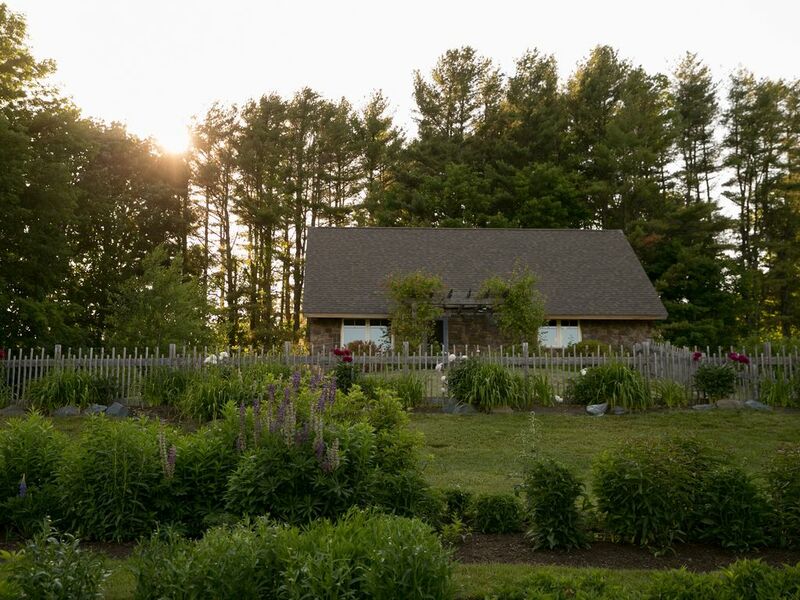 Marianmade Farm is a small boutique flower and lavender farm on the banks of the Sheepscot River with 13 private acres and 800' of shorefront. The property is filled with rows of lavender beds, hydrangea, peonies, and a countless mix of annual and perennial flowers. There is approximately 6 acres of wooded land and 7 acres of open space. Nestled at the height of the property is our beautiful 2 bedroom ICF construction cottage that sleeps 4 and a super sweet Air Stream Trailer that can sleep and additional 2 guests. In all there are accommodations for 6 adults or a combination of 2 adults and up to 4 children. The house has a full bathroom with tub-shower combo and each bedroom has a queen sized bed along with a small in room sink and vanity with personal mirror. The air stream has a full sized bed and 3/4 bathroom with sink, toilet and shower. The living room has a gracious seating area with a ventless gas fireplace and 43" flat panel tv. Direct TV is supplied along with High Speed Cellular Internet. The kitchen is fully equipped for the most discerning chef. There is a stainless fridge / freezer combo, along with a dishwasher, oven and gas range. The kitchen cabinets have Carrara marble counter-tops and beautifully appointed finishes. Flanking the kitchen is a banquette dining space which can accommodate up to 6 guests. There is a corner booth and two additional chairs. The kitchen is outfitted with all the modern conveniences a cook could need. The specific amenities can be supplied on request. The full bathroom in the cottage has a subway tiled tub / shower combo with a toilet and single sink vanity. Bedroom #1 faces the river and the flower fields while bedroom #2 faces back to the private garden behind the cottage that leads to the air stream. Blackout shades are featured in both bedrooms for complete darkness while sleeping if so desired. The house also has individual washer and dryer units which are located within bedroom #2. There is plenty of parking for guests right next to the cottage. The property also has a european drying barn that is used for drying lavender and hosting weddings and private events. These facilities will not be in use during our HomeAway guest's stays by others, however they are not included in the rental package of the cottage and air stream. If a guest would like to rent the barn portion of the property for a private event please inquire. Down by the water we also have a stone fire pit with granite seats and Adirondack chairs with wood supplied for an amazing campfire under the stars. english, I can understand a little French. My wife and I, along with our two young children live in the Greater Portland area. We purchased Marianmade Farm this Spring after discovering the property two years earlier. My wife is from Wiscasset and this property, being here, has very special meaning to us. Serenity, peace, privacy, waterfront, woods, flowers, the list goes on and on. There isn't a property like Marianmade Farm anywhere in Maine. The thought, detail and passion that went into designing and building the property as well as the care taken to keeping it so unique and special sets it apart. Once our guests drive through the gated entry they are whisked away into a dream. Our daughter believes its where fairytales are made. toilet, combination tub/shower, This is the full bathroom in the cottage. The bathroom in the cottage is a beautifully appointed with reclaimed slate tiled floors and a subway tiled shower. The property has direct water views of the Sheepscot River. The property has 800' of private frontage on the Sheepscot River. There is a cellular house phone. There is air conditioning in the Air Stream and the house is ICF construction (Concrete exterior walls), so stays very cool in the summer. Ventless Gas Fireplace and space heater. The cottage is ICF construction (Concrete exterior walls) and holds temperature very well. Stays cool in the summer and warm in the winter. There a bed linens provided for all beds with pillows as well. There is parking for multiple cars. AT&T MiFi High Speed Internet. Streaming of high bandwidth apps and websites is permitted with additional internet fee (Netflix, Apple TV, pandora, etc.) Please inquire. There are 6 bath towels along with hand towels and washcloths. Living room with sofa, and two occasional chairs along with a 43" flat screen and gas fireplace. Stainless steel refrigerator and freezer. Gas top range with 4 burners with full pots and pan inventory. Dishes and Utensils for up to 6 guests - all necessary kitchen items are included. Beautiful custom kitchen with full amenities. Custom cozy banquette dining with banquette seating for 4 and two additional side chairs with carrara marble table. YouTube TV through Apple TV (you can sign into your netflix, HBO, showtime, etc. accounts). Some of the most gorgeous gardens at a home throughout the property. The newly restored and refurbished Boothbay Harbor Country Club is within 15 minutes of the property. Wiscasset indoor pool is within 1 mile of property. Fire pit with stocked wood, outdoor seating, gardens galore, over 13 acres to traverse around the property, very private. We loved the cottage and the gardens. Beautiful furnishings and everything we needed was provided. We hope to return and explore more of the area--there's so much to do. This was the perfect spot for a much-needed summer getaway for us (family of 4 + our 2 four-leggeds). Absolutely stunning, all around. The grounds and the cottage are pristine with a warm vibe. A truly magical place. (And, the house did remain cool even on the warmer days in August.) The airstream proved to be a welcomed extension of the space as well, especially for our teenage daughter(!). John was a great host and Ed, the property manager, was a pleasure as well and a great help when we needed it! Highly recommend. Thank you, John & family, for a memorable retreat. Hope to be back again, someday. This house was exactly as advertised and everything we needed to enjoy our vacation. The location is great, within walking distance to many restaurants and waterfront. The property is stunning, perfect for those who appreciate a bit of space from other homes and busy streets. Our kids had plenty of space to play safely outside. This is truly a spectacular property. It is so private and incredible to look at. When we arrived and got out of the car, we couldn't believe the beauty of the place and the fragrances in the air from all the flowering shrubs, bushes and lavender. The house is very quaint and enhanced further by all the beautifully situated bushes, flower boxes and flowering containers surrounding the building. Inside, the house is very nice and well appointed with high quality furniture and appliances. We enjoyed cooking and eating in the lovely dining area. The views of the grounds from every window are really stunning. The rolling lawn that leads down to the river is so picturesque. Ed, the property manager, was around taking care of all the plants and flowers. We enjoyed talking with him; he does a top notch job of making the grounds of this place look spectacular! Our dogs loved running around and playing on the very spacious spread. We loved taking hundreds of pictures all over the property, including down by the lavender drying barn/function facility. We enjoyed sitting outside on the Adirondacks chairs and relaxing/reading and just drinking in the beautiful surroundings. It was very serene and rejuvenating! Luckily, we had fabulous weather the entire time, allowing us to take full advantage of the property. John was a pleasure to deal with and very responsive to every question we had along the way. We can highly recommend this property without reservation. Great time! Thank you John. True oasis for those looking for charm and elegance. The quiet property lends itself to the ultimate in relaxation. To awaken to the beautiful landscape of lavender and a variety of flowers made it even more perfect. Waking to Wiscasset for morning treats was wonderful. We had trouble saying goodbye! The owner, John, created a itinerary for our 4 day stay that made for the quintiscential Maine summer vacation for our family. Cannot wait to come back! The property is only 3/4 of a mile from the "Prettiest Village in Maine" - better known as Wiscasset. Downtown Wiscasset, which is only 45 minutes from Portland, Maine and 15 minutes from Boothbay harbor is right on the banks of the Sheepscot River. The cute town houses wonderful boutique stores, art galleries, and the world famous Red's Eats! You can easily walk to the downtown area from the cottage and grab a coffee and morning treats at "Treats", a splendid provisions store in the heart of downtown Wiscasset. The house is also only 1/2 mile from the Little Village Bistro restaurant which DownEast Magazine just voted best chef in Maine as well as Best New Restaurant for 2016!! Couldn't ask for a better option within walking distance. You can also visit www.wiscasset.org/visit/community_trails_/ for local hiking options.